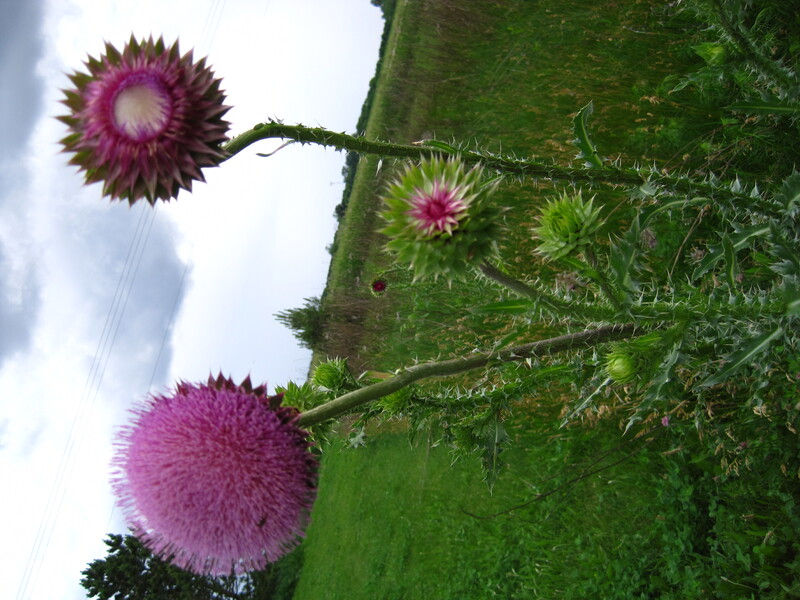 The Musk Thistle is considered a Noxious weed in Illinois. These Thistles were growing near the road. If you want to read about them click on the link below. They are beautiful and so is your poem Gerardine. Love the flow of your words. They are very pretty flowers. I just hate it when I accidentally step on them. Have a wonderful day! Wow — what a gorgeous flower! And a beautiful poem as well. You certainly do have a way with words, always love your descriptions of nature. Thank you, glad you were able to stop by. Just fantastic. loved the way you painted the scene with words. I love the bright pink of this flower, the words came easily. Thank you. They’re considered a noxious weed in our yard, too. But they’re pretty out in the wild. Uriah stays away from them.. I have stepped on them when they were small, ouch! They are pretty! Have a great day! Did you take that picture? I love the angles!! I knelt down in front of the plant. I didn’t realize how tilted the world is from that view. I appreciate you stopping by and leaving wonderful thoughtful comments. 🙂 Thank you and hope you are having a super weekend. Much love.